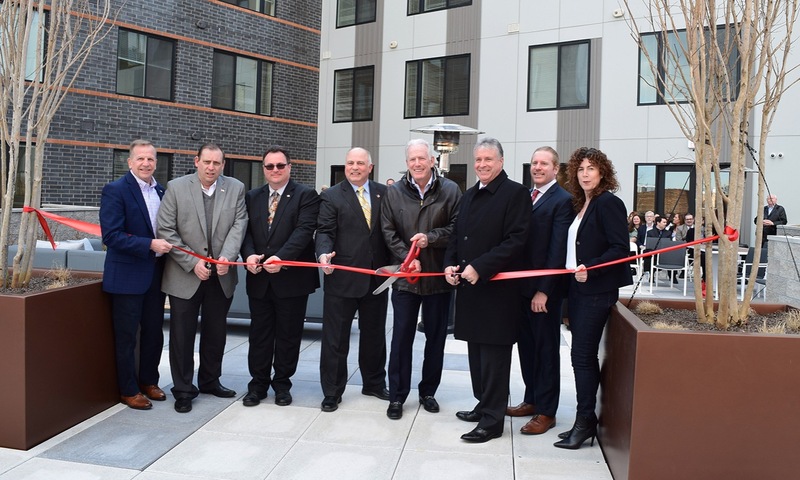 Bayonne, NJ – March 20, 2019 – Ingerman along with representatives from The City of Bayonne celebrated the grand opening of 19 EAST, a 138-unit luxury rental community located in Bayonne, Hudson County, New Jersey. The ribbon-cutting ceremony celebrates the construction completion of the property located off Broadway in the heart of downtown. Ingerman partnered with The City as part of its revitalization movement where demand for new, high-quality rentals is surging. The 138-unit community offers a mix of studios, one-, and two-bedroom apartments for residents with a variety of floorplans, some offering views of the Hudson River and New York City skyline. The apartments feature sleek, ultra-modern kitchens with premium appliance packages, quartz countertops, two-tone cabinets, hardwood flooring, climate control, porcelain tile, private outdoor space, and energy efficient appliances and fixtures. 19 East amenities include a resident lounge, game room, two furnished outdoor terraces with BBQ grills and fire pits, fitness center and digital fitness classroom, business centers on every floor, package concierge, storage units, and covered parking. Additionally, the Hudson-Bergen Light Rail station is a block and half away and numerous retail and dining options are just steps from the community. Not only is Bayonne considered to be one of the most walkable communities in America, it's also minutes from its Jersey City and Hoboken neighbors, with access to major airports, medical centers and New York City. ”The City of Bayonne is happy to welcome 19 East to our community. We expect this exciting new development to help revitalize the southern end of our Central Business District. With tenants in 138 apartments, 19 East will attract potential customers for the stores, professional offices, restaurants, and other businesses on Broadway. The completion of 19 East is another sign that Bayonne has a bright future,” stated Mayor Jimmy Davis, The City of Bayonne.